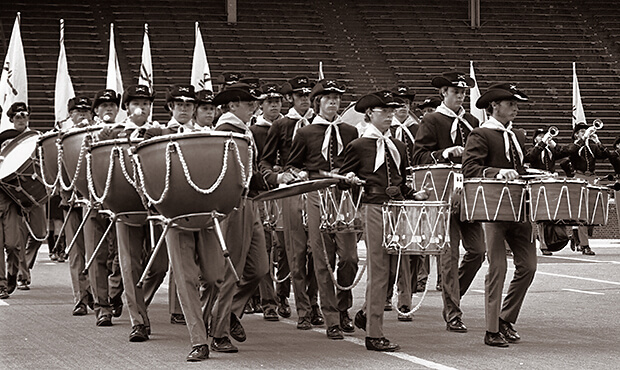 In 1975, the Drum Corps International World Championships went to the site of the signing of the Declaration of Independence for the start of the year-long celebration of the American Bicentennial. Franklin Field in Philadelphia was the site of the action, a venue built in 1895 that is said to be the oldest football stadium still being used for its original purpose. The Madison Scouts won their first of two DCI titles in 1975 while only losing the Prelims competition at the DCI Midwest Regional earlier in the summer; this despite runner-up Santa Clara Vanguard earning perfect scores in the Finals competition in what then were all three General Effect captions, Brass, Drums and M&M (Marching and Maneuvering). The Royal Crusaders made the Finals for the first and only time and Garfield Cadets made it into the top-12 for the first time in DCI's four-year history. 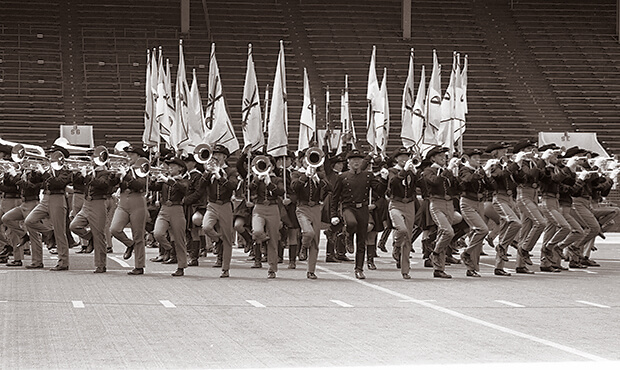 After placing sixth, second and fifth in the first three DCI World Championships, the Troopers ultimately finished in 12th place in 1975. The corps' production opened with Rex Mitchell's "Introduction and Fantasia," a concert band piece written in 1970. Mitchell was a professor of music education at Pennsylvania's Clarion University and a prolific band composer. After the brief "Introduction," which Mitchell wrote for marimba and clarinets, the corps jumped into the "Fantasia," marked to be played "spiritoso (spirited)" in the original musical score. Troopers' opener ended prior to the middle chorale section of the piece, which is heard in its entirety in the accompanying video clip. "Tubular Bells" served as the drum solo, a piece also played by the corps in 1974. The 1973 album of the same name was the very first record released by Virgin Records, and was the debut album of 19-year-old Mike Oldfield. The single and album achieved massive fame due to its use as the theme of the 1973 smash hit movie, "The Exorcist." An upbeat rendition of "Gentle on My Mind" was the "into concert," which was the common name in the 1970s for a shorter work that led a corps into its concert standstill, a part of the production that featured no marching. This piece was written by John Hartford and was performed by Glenn Campbell on the album of the same name, which also included the hit, "Wichita Lineman." The song and album won four 1968 Grammy Awards, two for composer Hartford and two for performer Campbell. Millions knew Hartford as a fiddler and banjo-playing regular on the "Smothers Brothers Comedy Hour" that ran on CBS from 1967 to 1969. A jazzy rendition of Modest Mussorgsky's "Night on Bald Mountain" served as Troopers' concert standstill. The piece is based on the Russian legend of a witches' sabbath, a meeting of those who practice witchcraft. Mussorgsky wrote the now-famous piece in 1867, but the version most people recognize was actually orchestrated by Nikolai Rimsky-Korsakov in 1886, five years after Mussorgsky died. Walt Disney helped to make the piece even more famous when he selected it for his 1940 animated classic, "Fantasia." Tragically, Mussorgsky never heard any version of the work performed during his lifetime. Two selections from Alfred Newman's score for "How the West Was Won" made up the "out of concert" production. "No Goodbye" and "I'm Bound for the Promised Land" were two of the most recognized melodies from the 1962 smash hit film that told the story of westward migration across four generations of the same family between 1839 and 1889. The movie is considered by many to be one of the prime story-telling masterworks about the development of America and was inspired by a 1950 series of photo essays in Life Magazine. It's a shame that Alfred Newman isn't better known for his work on more than 200 films, being that he was one of the pioneers of writing original music for films and was also so successful. Though not among the most famous of film composers, he was nominated for an Academy Award 43 times and won the top honor nine times, the most of any composer. He also adapted many Broadway musicals for film and conducted the music for several film adaptations, including "The Sound of Music" and "Camelot." Another brief drum solo led into Troopers' closing piece, "The Virginian," the Percy Faith theme song written for the NBC Western series that ran from 1962 to 1971. The series starred James Drury and Doug McClure and is the third-longest running Western in television history, only after "Gunsmoke" and "Bonanza." Following the 1975 season, Troopers slipped to 13th in 1976 and 20th the following two seasons, returning to the Finals competition in 1979. Another drop put the corps out of the top 12 until 1985 and 1986, not returning again until 2009. For this week only, you can save on the Legacy Collection DVD that contains this complete Troopers performance, along with all finalists from the 1975 DCI World Championships. Discount DVD offer ends Monday, March 3.